Arthritis in lower back can utterly ruin your life but there is hope. Sometimes I am utterly humbled by the power of Chiropractic. When you as a practitioner are faced with a case history like this one, you absolutely know that Chiropractic Help has to do something special; it's an awesome responsibility. Mrs P, aged 69 first consulted me two months ago with a fifty-year history of low back pain. Her mother too had a horrid back. For the last year it had been unbearable and the pain in the right buttock and both legs despite various medical treatments was disabling, and walking had become very difficult. Contrary to most backs, sitting caused no pain, and bending forwards relieved the pain. Extension, backward bending, was very painful. 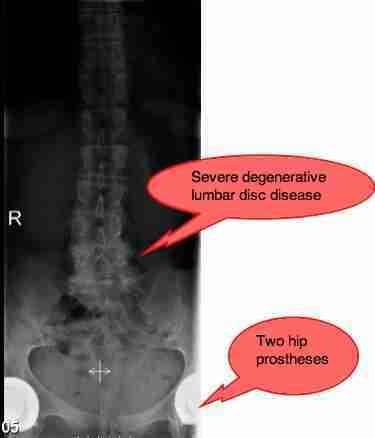 It all added up a serious diagnosis: Lumbar spine stenosis. Call it back arthritis if you will, affecting the spinal nerves, and often the spinal cord itself. There was nothing good about her case. As a smoker, I was concerned whether she would respond at all. 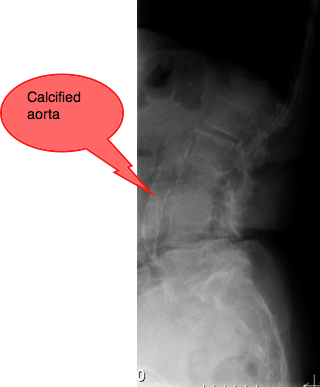 Despite no mention on the radiologist report there are strong indications of heavy calcification of the aorta, the large artery suppling the kidneys, bowels, other organs, lower spine and legs. I need a second opinion, as I'm of the opinion there is an aneurism brewing. Only smokers and heavy drinkers get them. Many, perhaps most, Chiropractors, concerned about being sued wouldn't take on a case like this. The risks are high, the probability of a good outcome poor. The first obvious abnormality was a short left leg, between 5-7mm. Sometime authorities think this not significant, but it's my fist step in a difficult case like this. She now wears a heel lift of 5mm in her left shoe. That immediately partially corrected the spinal curvature. There were disturbing neurological findings in her left leg. Weakness of the quadriceps, change in its reflex, and numbness on the side of the leg. The Femoral nerve stretch test was positive causing pain in the upper leg. Thirdly, her sacroiliac joint anatomy was absolutely haywire. Orthopaedic tests were positive, and the fixation I would describe as like 'concrete'. Absolutely jammed, stuck, fixated, subluxated; what's more, badly so. No wonder the poor woman couldn't walk. All in all a tough call. The question is where to start with a case like this. 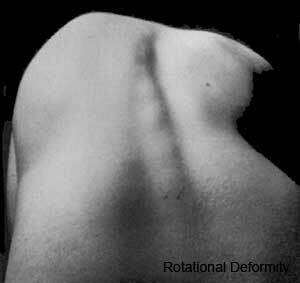 Back arthritis is challenging for the practitioner, it's widely acknowledged. There are so many problems... I chose to start with some Thompson drop treatment on the sacroiliac joints and a very gentle side-posture drop bilaterally. There were no audible releases. Lumbar spine stenosis is caused by extreme arthritis in lower back, and also by certain hereditary features. I haven't needed to change the treatment, it has been so effective. It's not perfect of course, but she has little pain, plenty of stiffness but she is faithfully doing my exercises. She can walk again! With the heel lift. I now need to get to her feet to see if there are fixations, and a dropped arch. She's had nine treatments in nine weeks, and we are now spacing them out: the next over three weeks. When a 69 year old woman starts flirting with you, then you know it's getting better. I love the spirit of so many elderly Dutch people. So many of them at 70 and 80 and even 80+ are younger than some people I could name in their twenties. It's those brewing aneurisms that are going to get her, and probably quite soon. There are more than likely others in her head and neck. I don't touch her neck! She is on blood pressure treatment. Hopefully it'll be a quick and clean stroke, not on the day of a chiropractic consultation I hope, but it's coming, whether I treat her or not. We have discussed these things. She knows the risks, but her quality of life has improved to such an extent that she presses on. And so do I. Gently. Update: Mrs P continues to do well. We have now exended the maintenance treatment to every six weeks. And, the arthritis of the back is no different. Another X-ray would probably look just the same. But she's a different woman. The arthritis of the back wasn't per se the cause of her pain. The love of North Americans to sue their doctors at the drop of a hat, means that many patients with conditions like this go untreated, or undertreated. They must suffer; the Americans and Canadians have so intimidated their doctors that few would have the temerity to take on a case like this. Dear Dr B, I thought I must drop you a line to let you know that all the hard work you did on my frozen shoulder before I went to the UK really paid off - my shoulder has returned to nearly 100%. I occasionally have pain when I wake up in the morning. Have been good about doing all my exercises and know that it is really essential to keep on exercising. Hope I never experience this horrible condition again. I don't feel I need any treatment at the moment, but know where you are should I need it. In a landmark case a Chiropractor was successfully sued a few years ago after a patient had a stroke SEVENTEEN days after a chiropractic treatment. Mrs P could have one any day, and it would have absolutely nothing to do with chiropractic. The treatment with drops is really quite gentle. It's said that a country gets the politicians it deserves. And certain other professions too. I'm sad. Hyaline cartilage is the super-smoother-than-ice (literally) substance that lines the ends of bones within a joint. The friction coefficient is lower than that of ice-on-ice. It's covered with highly specialised chemicals that retain water. 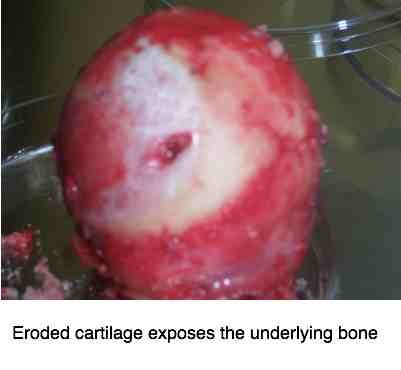 This cartilage has no blood supply of its own and its nutrients and oxygen comes from the fluid within the joint. If that fluid is deficient... or isn't swishing about, ARTHRITIS of the back. Taking anti inflammatory drugs and particularly dual antiinflammatory drugs for extended periods for arthritis in lower back is nothing but a snare and a delusion. Those arthritic joints need to start moving, that's their salvation, not drugs except perhaps in very exceptional cases. Obviously I have no pictures of the hyaline cartilage lining the ends of Mrs P's bones, but it certainly looks more like the next graphic than our pig's beautiful shiny smooth hyaline cartilage. Chalk and cheese, I can hear you thinking. Prevention is the name of the game, because once that hyaline cartilage is eroded away like this, pain and disability become the norm. Research shows that if you are significantly over weight, that losing a lot of weight is the most important treatment you can do for arthritic hips, knees and feet. So choose: a knee replacement (or two?) or lose 50 pounds. Your call, it's probably going to be one or the other. It's true in religion, but it's true in healthcare too. Like: "You have arthritis, Mrs Jones. I'm afraid there's nothing to be done." It's a conviction commonly held in medical circles and light years from the scientifically proven truth. Think fatty fish, think exercise, think weight loss, think strawberries, think magnesium deficiency; FRESH SPINACH RECIPES - the richest source of magnesium.) ... think Chiropractic. But yes, sometimes it is difficult. Always? Definitely not! It behooves each and every one of us to make sure we are daily enjoying those foods that have a proven anti inflammatory effect. It's not hardship to use olive oil on your salad, enjoy fatty fish at least three times a week, and dip daily into the chenopod family. For example, swiss chard nutrition is so quick and easy. Read more at foods to reduce inflammation. A chronic sciatica is often the result of arthritis in lower back. 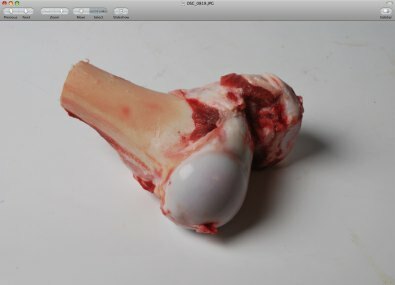 CHICKEN BONES extract for healthy cartilage.